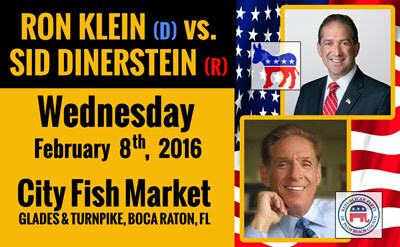 Ron Klein (D) vs. Sid Dinerstein (R) : An Unusual President … What to Expect? You are here: Home / Events / Ron Klein (D) vs. Sid Dinerstein (R) : An Unusual President … What to Expect? Ron Klein a member of Holland & Knight’s Public Policy & Regulation Group, has worked in the private sector as a business and transactional attorney for over 30 years and in the public sector as an elected official in both Tallahassee and Washington, D.C.
Sid Dinerstein is the author of the book “Adults Only: For People Who Love Their Country More Than Their Party” and is an outspoken critic of the political dynamics dividing America. From 1992 through 1996, Mr. Klein served as a State Representative in the Florida House of Representatives and participated actively in economic development, financial service and healthcare committee legislative work. From 1996 through 2006, he continued his service in the Florida Senate being elected as the Minority Whip and Democratic Leader. During his 14 years in the Florida Legislature, he earned the respect of his peers and was viewed as successfully working with and cultivating bipartisan relationships.